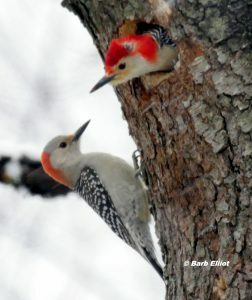 It’s spring, and once again I hear the songs of Northern Cardinals, Tufted Titmice, Mourning Doves, and House Finches as well as the drumming of Downy Woodpeckers and Red-bellied Woodpeckers. These and other local birds are attracting mates and warning rival males to stay out of newly claimed nesting territories. At least nine bird species have nested in my yard over the years. 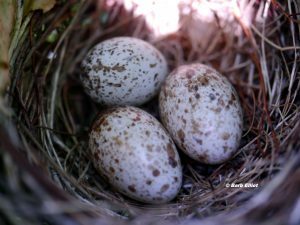 As I look back, I remember the joy of seeing birds raise and successfully fledge their young, the heartbreak when things don’t work out so well, and the things I learned along the way. Male Red-bellied Woodpecker at his work, March, 2018. © Barb Elliot. Click to enlarge. 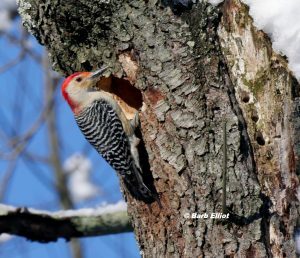 In early February, 2018, I noticed a male Red-bellied Woodpecker tapping near the top of a dead Black Cherry tree trunk in my yard. I had left this snag because dead wood is scarce in our tidy landscapes but sorely needed for nesting, feeding, and resting places of birds and other wildlife. Several other woodpecker species – Downy, Hairy, Pileated, and Northern Flickers peck this tree and look under its peeling bark for grubs and other insects. Carolina Chickadees, White-breasted Nuthatches, and Brown Creepers also scour the bark for insect morsels. I was happy to see the Red-belly using this tree to start excavating a nesting cavity. Male Red-belly joined by his mate. © Barb Elliot. Click to enlarge. 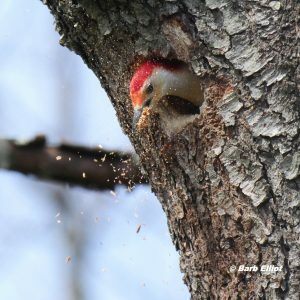 The Red-bellied Woodpecker worked day after day at this hole in all types of weather, and I was excited to see his progress. At first he could just fit his head into the hole, but soon got half his body inside, then his tail. Finally he entered the cavity and looked out the hole. He was joined by a female Red-belly, and they took turns at the work. One would enter the hole, work inside, and call the mate. The mate then entered the cavity to gather small wood chips and sawdust in its bill and spit them out of the hole. Click here for a 2-minute video of this activity (better viewed on a large screen). Male expelling sawdust and wood chips from the cavity. © Barb Elliot. Click to enlarge.before flying off. By early May, after more than three months, excavation stopped. 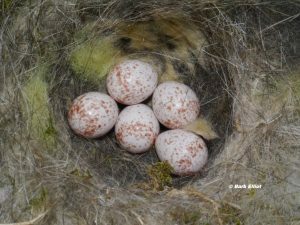 In mid-May I saw the female enter with food in her mouth – the baby birds had hatched. 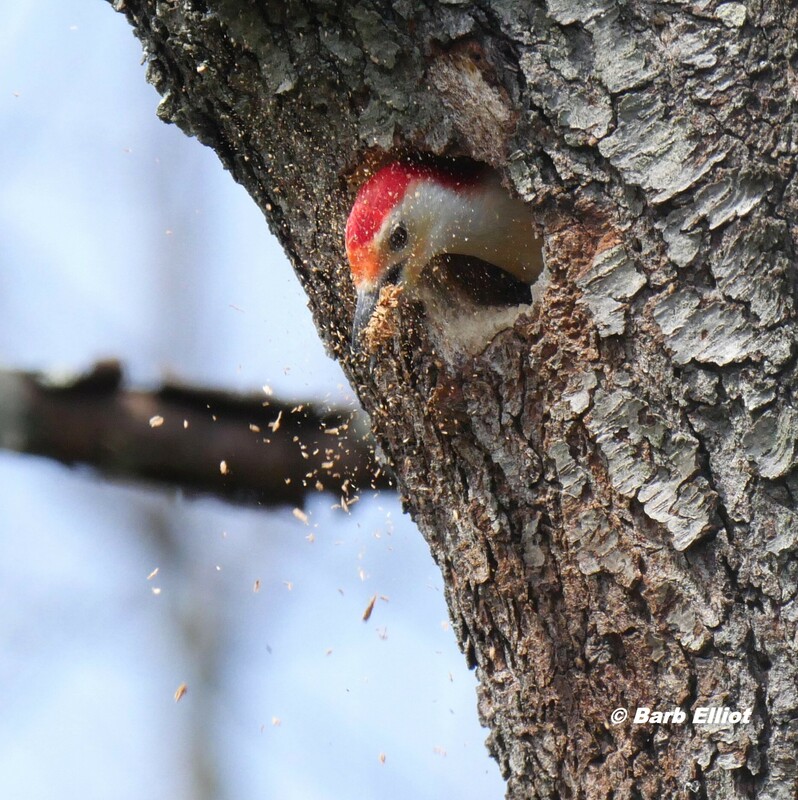 I could hardly wait for nestling Red-bellied Woodpeckers to peer out from the hole! But alas, it was not to be. A few days later, the Red-bellies called repeatedly near the nest, but never entered it again. I understood their agitation when a pair of European Starlings exited the hole. These invasive cavity nesters had taken over the hole and removed the baby woodpeckers. Sadly, the Red-bellies’ nesting season was over. 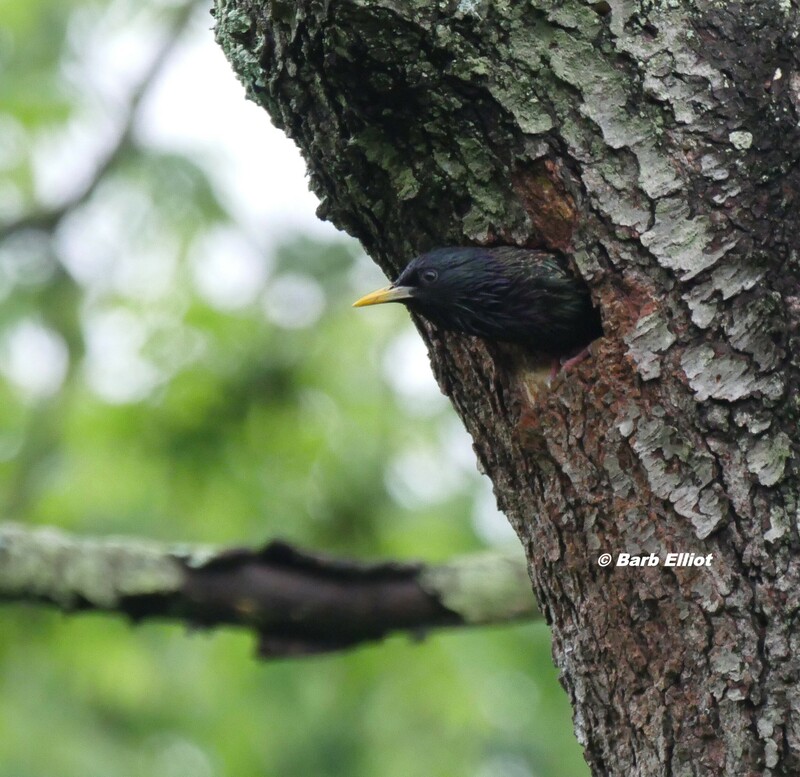 European Starling peering out after taking over the Red-bellies’ nest cavity. © Barb Elliot. Click to enlarge. 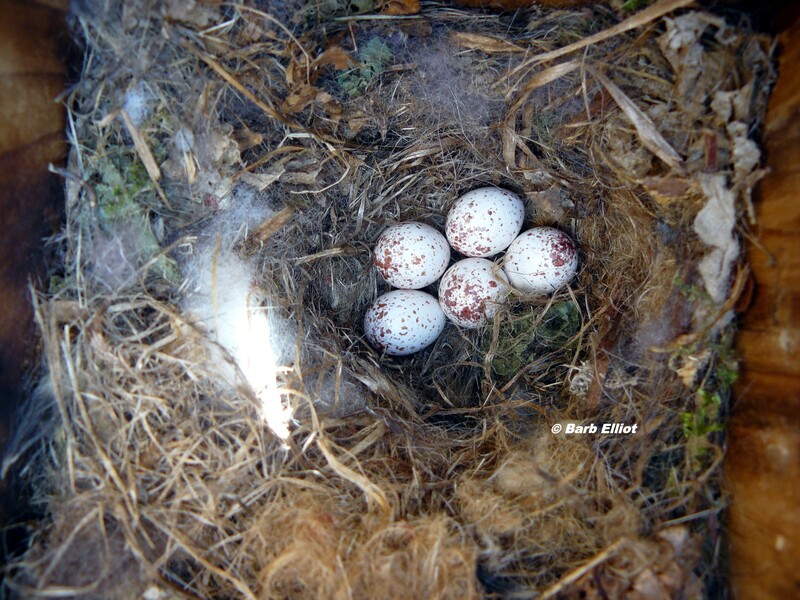 Tufted Titmouse eggs in one of my nesting boxes. © Barb Elliot. Click to enlarge. Titmice, Carolina Chickadee, and House Wren, but with entry holes small enough to exclude House Sparrows and European Starlings. I monitor the nest boxes no more than once a week to minimize disturbing both nestlings and parents. 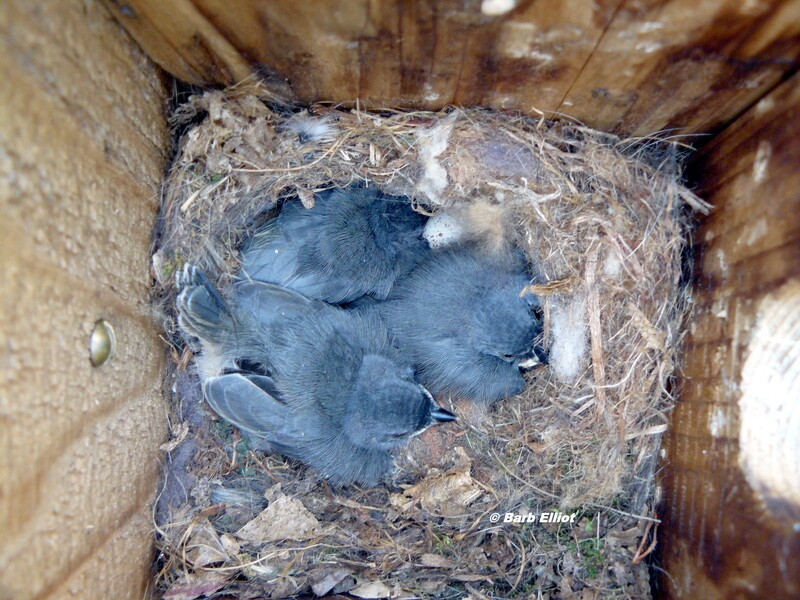 Tufted Titmouse nestlings. Notice one unhatched egg. © Barb Elliot. Click to enlarge. 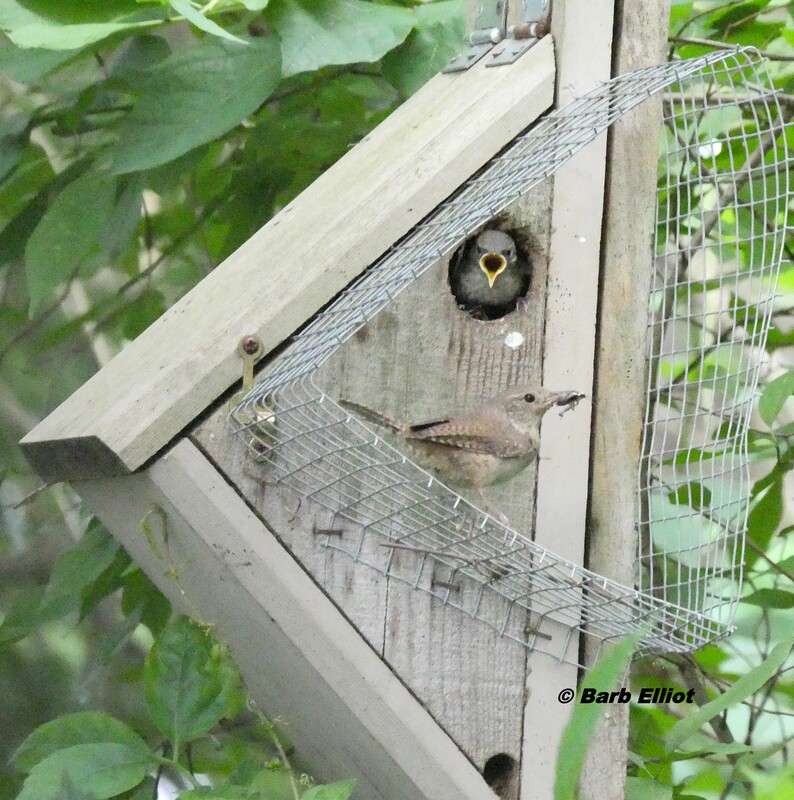 House Wren with small caterpillar eyed by hungry baby. © Barb Elliot. Click to enlarge. planted a diversity of native plants to host a diversity of insects. 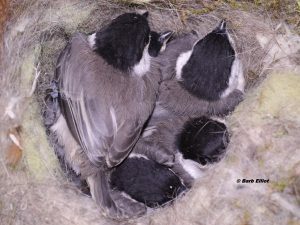 According to University of Delaware professor Doug Tallamy, to raise a clutch of baby birds healthy enough to leave the nest, a pair of Carolina Chickadees must feed them between 6,000 and 9,000 caterpillars! 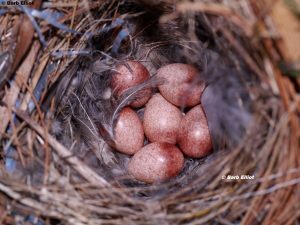 Carolina Chickadee eggs in another of my nestboxes. © Barb Elliot. Click to enlarge. Carolina Chickadees almost ready to fledge. © Barb Elliot. Click to enlarge. study of 200 suburban yards in the Washington, DC area. Scientists from the University of Delaware and the Smithsonian Migratory Bird Center tracked nesting Carolina Chickadees and found that residential yards dominated by nonnative plants did not provide enough insects for birds to raise their young. Chickadees were successful in raising and fledging young only when at least 70 percent of the plants in a yard were native to the region. Birds larger than chickadees, such as Red-bellied Woodpeckers, obviously need even more insects and thus a higher percentage of native plants. We should all strive to have more native plants in our yards. American Robin nest in my Trumpet Honeysuckle vine. © Barb Elliot. Click to enlarge. 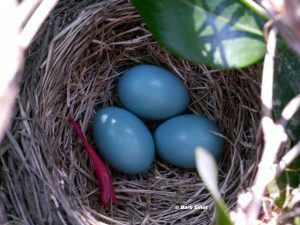 Several cup-nesting bird species – American Robin, Northern Cardinal, Song Sparrow, and Mourning Dove – have also nested in my yard. 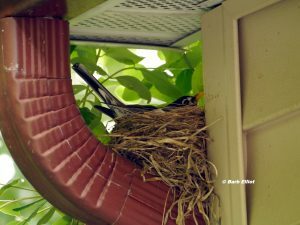 Robins nested in a vine, an evergreen tree, on top of a curved downspout, and on top of a wreath hung under my porch overhang. American Robin nesting in the crook of a downspout. © Barb Elliot. Click to enlarge. These birds certainly need native plants to find sufficient insects to feed their young. However, they also require native trees, shrubs, and vines with dense branching and leaves to provide good structure for the nests and concealment from predators. 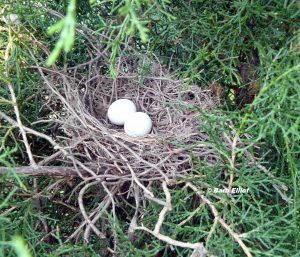 Mourning Dove nest in one of my Eastern Red Cedars (Juniperus virginiana). © Barb Elliot. Click to enlarge. For example, several pairs of Song Sparrows and Mourning Doves have successfully nested in my Eastern Red Cedars (Juniperus virginiana). These evergreens are dense, hide nests well, are difficult for predators like raccoons to climb, and host more than 40 species of caterpillars. song Sparrow nestlings in another of my Eastern Red Cedars (Juniperus virginiana). © Barb Elliot. Click to enlarge. 1. If you add a nesting box, do a little research to select a box with dimensions for the birds you want, and mount it at the suggested height. 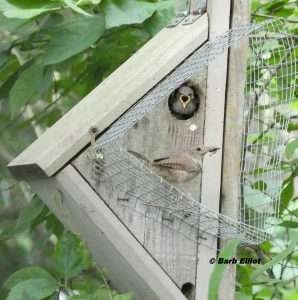 House Wren parent with bug and hungry baby. I added this hardware cloth predator guard after losing a full set of nestlings to a predator that reached into the box. © Barb Elliot. Click to enlarge. 2. 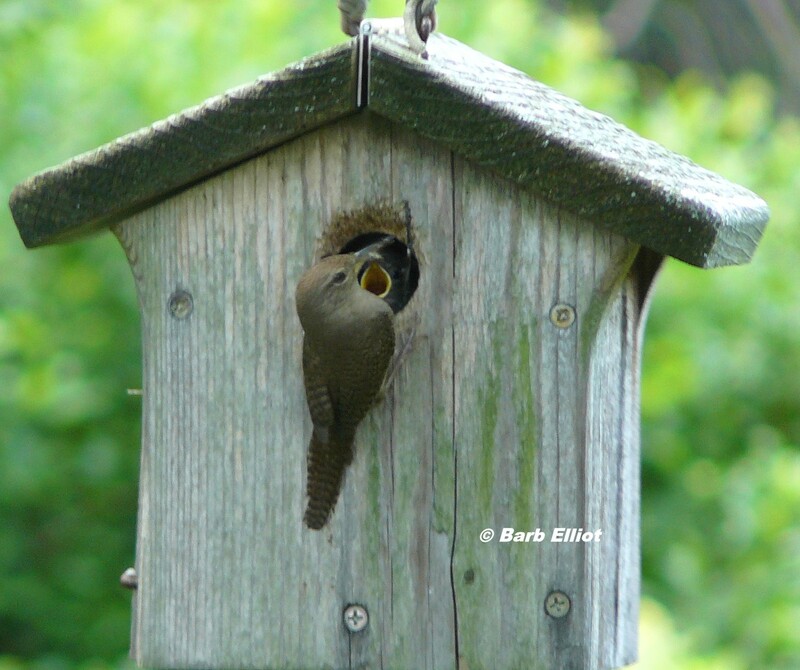 Nesting boxes with a predator guard of wood or hardware cloth will make it harder for predators like raccoons and squirrels to reach into the box. A baffle can be added below a box mounted on a pole or wood support. 3. Check a nest no more than once a week. 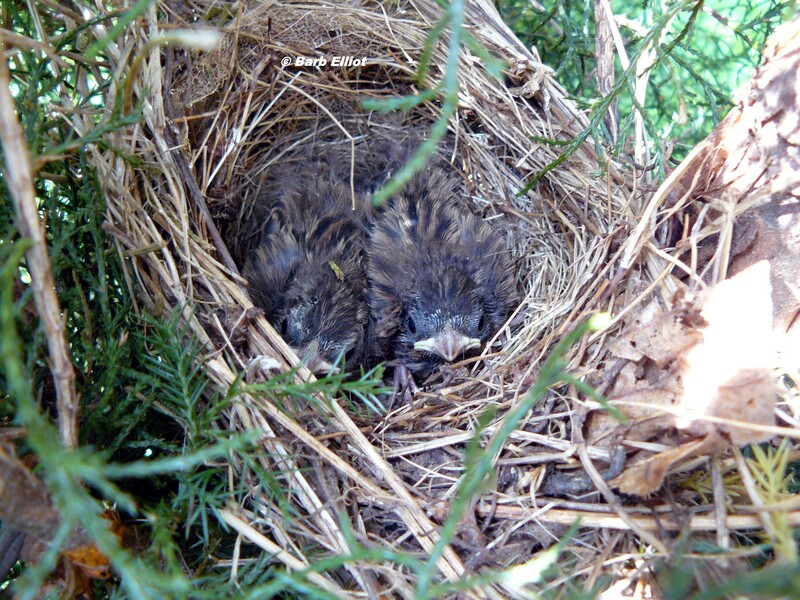 Avoid checking nests when the young are close to fledging. They may be startled into leaving the nest early and be more subject to predation. House Wrens found many feathers to add to this nest, but the blue plastic strips on the left might entangle babies. © Barb Elliot. Click to enlarge. 4. It’s better not to put out nesting material, as birds can find natural materials. If you insist on providing something, do not put out yarn or hair longer than 2” to avoid entanglement. Dryer lint, human hair or hair from dogs treated with flea/tick medications should not be used. 5. Check your yard for any plastic that birds may use as nesting material. A healthy baby Robin perished in a local nest when a plastic strip used in the nest wrapped around its leg and prevented it from flying from the nest. Northern Cardinal nest in Barb’s Virginia Creeper on a trellis. © Barb Elliot. Click to enlarge. 6. If a baby bird without feathers is on the ground, return it to the nest. However, a baby bird on the ground that has feathers likely has parents nearby. Many newly fledged young spend time on the ground and are fed by parents for several days after leaving the nest. 7.Leave cats indoors year round to prevent killing of babies and adult birds. 8. Don’t use pesticides or herbicides. Birds and other wildlife in a healthy habitat will keep insects in balance. 9. 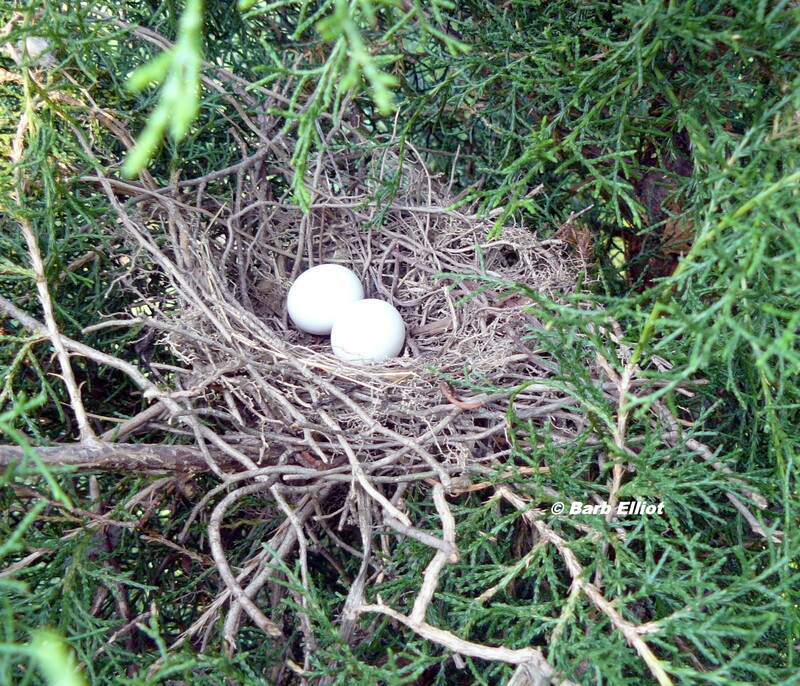 Avoid trimming shrubs and trees during nesting season. 10. At the end of the season, clean out nesting boxes. This allows birds to use the box for roosting and cuts down on blowflies and other insect parasites that may prey on future nestlings. 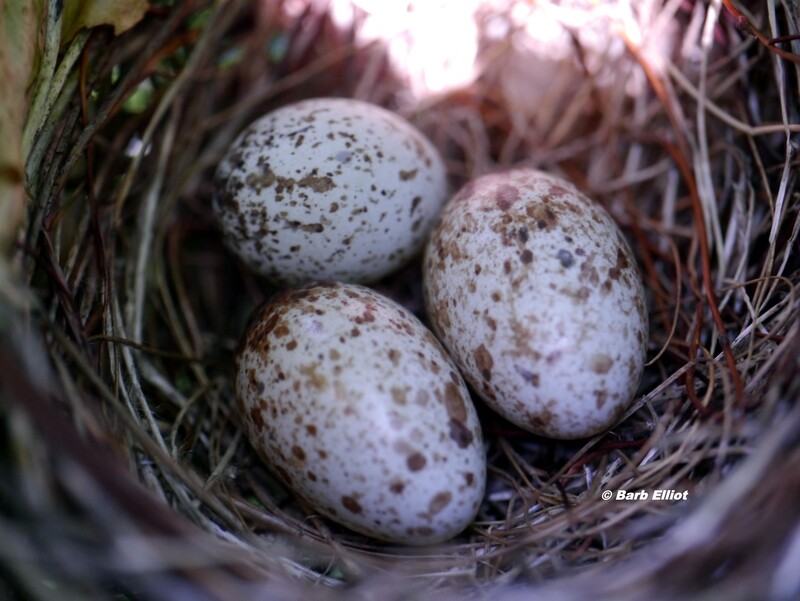 Above all, enjoy the birds that visit and nest in your yard! If you have (and keep adding) native plants, you can be assured that there will be enough food for them to successfully raise their young. barb on Hummingbirds Wintering in Pennsylvania! Lynette Collina on Hummingbirds Wintering in Pennsylvania! Copyright © Backyards for Nature. All rights reserved.